SugarSync assumes that you have different synchronization needs on your different computers. Unlike Dropbox, SugarSync doesn't sync just one default folder among different computers. Instead, it lets you specify any of the folders on your various computers to be synced to the cloud. Once you’ve specified a given folder on one machine, you can opt to link that folder to directories with the same name on any or all of the other computers you’ve linked to your account. Files on those various machines are all stored on the company’s central servers, where they're available through a Web interface. If you want to rely on a single folder that automatically syncs to all your machines, the service sets up what it calls a Magic Briefcase; it’s certainly more convenient than linking a bunch of separate folders. The briefcase gives you the advantage of Dropbox’s simplicity if you want it. Some services sync files between machines on the same LAN over the local network connection instead of requiring a round-trip to the company's cloud storage; SugarSync doesn't. Any folder you have set up to sync with SugarSync can be shared. You can share folders only; you can’t set sharing permissions file-by-file. Selecting the folder in the SugarSync File Manager and clicking the Share button opens a page at the developer’s Web site at which you enter e-mail addresses and choose the level of access. You can set shared folders as read only or add and edit (read/write). Unfortunately, SugarSync isn’t as exhaustive as other services in storing older versions of your files. No matter which version of the service you have—individual or business, free or paid—SugarSync stores only the five latest versions of each file; deleted files are stored in a special folder until they are permanently removed. This is particularly unacceptable if you’re using it for business collaboration where multiple users may successively revise the same file. Also, the service counts both deleted files and old versions against your storage quotas. For security, SugarSync uses strong encryption on everything—access to the Web site, desktop sync, and local storage on its servers—but, then so does almost every other major online storage service. Because it focuses on individual settings for each machine, SugarSync’s desktop client is more robust than you’ll find on most of its competitors. While it’s not a full-blown Mac app, it’s not a thin applet either. But it is an odd bit of software: Instead of the usual tabbed dialog box, each option on the SugarSync menu opens its own floating dialog box, unconnected from the others. You could have five different boxes open at the same time, each with different functions, some of which are non-modal (you must click OK or Cancel to activate or dismiss them). It’s almost a desktop program, but having all these separate interfaces is seriously confusing. Setting up a business account on SugarSync requires the use of a Web interface and doesn't provide many configuration options. That’s not to say that those dialog boxes don’t provide some useful functionality. For example, the Manage Sync Folders dialog lets you add folders to be synced; from there, you can sync folders to the cloud only or to other computers you control. But SugarSync needs to rethink its desktop client, integrating its features into a full app instead of fragments. It’s aggravating as it is. SugarSync does have best mobile support of any service we reviewed: It has apps for iOS, Android, BlackBerry, Symbian, and Windows Mobile 5 and 6; it also has a mobile Web site. SugarSync’s business services seem to be stapled on top of its standard offering, rather than fully integrated. (To be honest, you could say the same thing about most of its competitors.) 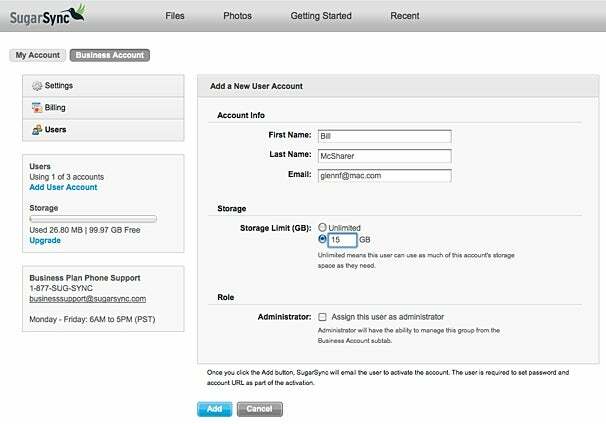 The storage quota is pooled among all users, and an administrator manages accounts. But setting up those users requires a slog through the Web interface; you can’t assign group permissions; and there’s really nothing special about sharing a folder with a member of the same business account compared to sharing that folder with just anyone. SugarSync has a variety of pricing plans, from free (which gets you 5GB of storage) to $40 per month (or $400 a year) for 500GB. Group plans start at $30 per month (or $300 a year), which is good for 3 users and 100GB. Additional storage is available for $30 per month (or $300 a year) for every 100GB; you can add more users for $10 per month (or $100 a year) each. SugarSync’s desktop sync software needs a rethink, with too many separate pieces unaligned into a consistent interface. However, its ability to specify which folders on each computer will sync to other machines is quite useful. Its business services offer little advantage over individual accounts.